We all want to save money in order to buy other things we desire and monthly bills are always in the way of that. Fortunately, there’s Simple Mobile that helps us reach our desires. With very cost-effective plans and, as the name implies, simple explanations on how their service works, Simple should simply be a prepaid plan you should really take a look at. So how good is Simple Mobile? It’s simple: simply good. Tongue twisters aside, let’s get right onto the review, shall we? If you want to take a closer look at our reviews of the best prepaid plans, we’ve got the Top 5 of them right here. Now, let’s get right on to the plans and pricing. You get either 1, 2 or 6 GB of data every month that you can use for calls, texts and internet surfing while Truly Unlimited speaks for itself. They may not offer much, but just like Freedompop’s budget-friendly plans, these plans are good enough for people who don’t want to spend a lot on phone bills alone. Verizon users have an average spending of $148 every month from 2014 to 2017 due to the high costs of their plans plus perks with the exclusion of taxes. If you see those numbers as sore eyes and want something significantly cheaper, Simple Mobile is one of the right places to be in. As the name of the phone carrier suggests, there are no other perks to see here. What you’re getting are just the essentials to get you right on it. This makes Simple Mobile both great for newcomers into the world of cell phone technology or to people who barely even communicate with others through the phone. Yes, they really are cost efficient, but mind you that each plan price excludes taxes. Bummer, right? But at least it still shows up in the bill to be cheaper than any leading phone carrier to date. What we do like, however, is how consistent the network quality is. If you’re in an area in the country where coverage is strong, expect quality as good as Verizon. Internet surfing barely lags, sending messages is a breeze and call quality is always top-notch no matter what phone carrier who you’re calling is. There are also no activation fees here whatsoever but what they do have is a discount for when you want to avail for their re-up offers. What is an Auto Re-Up? Simple Mobile offers a plan for its users called auto re-up; meaning you don’t have to worry about asking the company to return the amount of data back on the next month. If you have auto re-up activated, you’ll be able to receive your data on a monthly basis in just a snap. And the best part? You’ll receive a discount too depending on which plan you want to avail! There’s not much to be had with their basic 1 GB except that it’s very cheap and good for that one person who just doesn’t like talking and texting with other people and will only use it when needed. Besides it’s just $25 a month; $20 if you’re going with the auto re-up. If you’re thinking of using this for net browsing, you’re going to regret that because this plan is only good for a few minutes of web surfing. If you’re planning on watching videos, get ready for the big succ on your data. Again, if you’re the introverted type who only needs a plan in case someone texts or calls you for important matters, it’s good to have this as this isn’t also heavy for your wallet. This is more tailored for casual phone users who would regularly use the phone for calling, texting, and some days of internet browsing on the go. This happens to be a heavy favorite of parents for their teenage kids as 2 GB is enough for their smartphones. It’s $30 per month but it can be just $28 if you’re up for re-up.Yes, teenagers are okay with this (as well as teenagers by heart) because it’s enough to get them talking with their friends at school or use it to surf the web while taking the bus back home. This is more in favor of heavy phone usage that combines all elements of calling, texting, and internet surfing. It’s good for when you have a large circle of friends or if you’re in a small business. $40 a month for this service is decent along with the $3 off if you want to include the auto re-up but for us, it’s much better to go for another phone carrier that offers the same such as Freedompop or Metro PCS as both have better coverage than Simple Mobile. So is this…well, truly unlimited? Yes it is but according to phone carrier critics and experienced Simple Mobile users, there have been lots of cases where Simple Mobile tends to throttle data speeds in an unpredictable fashion. However, the price is only $50 and $60 a month – one of the cheapest unlimited data plans you can ever find but with the lack of perks and inconsistent network speeds, you’re better off chugging on Sprint as the latter has better coverage and bigger perks. Okay, so you may have the hotspot for $60 a month but even that has some throttling issues in which representatives of Simple Mobile don’t want to tell about – which suddenly makes their unlimited plan look very shady. But look at the bright side: no overages at all. In short, you do pay for what you get: if you want an affordable unlimited data, you won’t find anything else like this. Honestly, we were surprised to find out that Simple Mobile offers some of the latest phone models from big name companies as well as more niche ones except Google Pixel is out of the picture like T-Mobile. No refurbished models in sight here; they’re all brand-new which is very impressive especially knowing that they are a smaller profile prepaid company. This is where things get a bit off for Simple Mobile. The coverage is backed up by T-Mobile but for some reason, it doesn’t have the same coverage as the giant brand. If you live in the metro areas, okay you’re covered as any other major brand but if you’re from Central or any part of state that isn’t in the downtown areas, Simple Mobile won’t cut it for you. On a side note, tt’s also not available in Canada. One way to put it that is contrary to the brand name, Simple Mobile’s customer service is confusing. As in when you talk to a representative, they talk with confidence and a sense of positivity but their answers aren’t always the same. For example, if you ask one representative about throttling speeds in their Truly Unlimited data, they’ll say “Yes Ma’am/Sir there are throttling speeds.” On the other representative, they’d say there aren’t any throttles. We want to trust Simple Mobile and their staff’s word for it but we just can’t – not until they’re on the same transparent note. But on the good side of things in customer service, it’s mostly organic whenever you contact them. There are little to no bots who will answer your calls or emails and these guys respond fast. While we can’t trust all the reps in Simple Mobile, we want to give credit to their always-positive way of communicating with the customer. It’s hard to maintain such brightness especially if the customer is in deep crap. Staffs in the physical stores are also quite nice according to experienced users. They help break down the nitty gritty for the customers who still seem confused by their already-simple plans. The best part about their customer service, however, is free service. If you have a dilemma with their network, they’ll fix it up for you right away without any payment at all. Set-up for the hotspot is easy too. If you can’t seem to do it yourself, you can always ask for an on-site technician to do it for you and they’ll do it with a smile. Simple Mobile is certainly…simply good. Despite the lack of coverage in some areas outside the metro as well as a bit of uncertainty with their unlimited plans, Simple Mobile is cheap, fast, and very sufficient for low-budget phone usage. We do recommend getting either the 2 GB or 6 GB plan depending on your usage and frequency but if you’re tight on budget and doesn’t fancy those big perks from the likes of Verizon and AT&T, this should be a good cake to have. As for network quality, it’s pretty consistent if you live in the metro area but can be laggy when you’re slightly outside the area. Prices are good as advertised but don’t expect just that to pay up every month as each plan price is excluded from taxes. We know you don’t like excluded taxes but hear us out: even if you have to pay for that separately on a monthly basis, it’s still way cheaper than AT&T or even Sprint. Besides taxes, you don’t have to pay for extra fees like any sort of activation fees or overages as those are non-existent in their business. You can opt for their auto re-up service that automatically recharges your data on a monthly basis and if you do subscribe to that, they’ll give you a monthly discount on the bill. 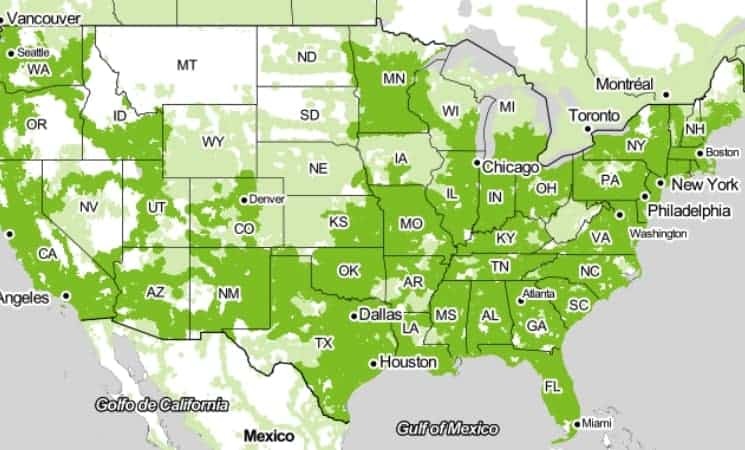 Yes, the coverage is weak in the rural areas of the map so if you happen to live there, it’s either you cope up with their inconsistent network quality or go for something stronger like Metro PCS. Phone offers are pretty decent as they offer a few selections of the latest phones from the likes of Apple, Samsung and LG. You won’t find any very old and refurbished models here; everything is first-hand and brand-new. As for customer service, we do appreciate the bright tone of their representatives as well as being very responsive to messages whether email or direct message. Hotlines are very responsive too but what we mainly want is for their reps to have more intensive knowledge and transparency about their own company’s services. If you need help because of some problems you’re dealing with their network, they’ll handle you with care and the best part is that it’s all free whether it’s going to their store or a technician on-site visit to your home. At the end of the day, Simple Mobile is very user-friendly (even if taxes aren’t in their advertised prices) if you subscribe to the right plan. You’ll still be able to save up lots of bucks versus subscribing to Sprint even — which will cost you as much as $95 a month. It’s not as powerful as Metro PCS’ prepaid plans but it certainly does its work well as a budget-friendly phone carrier service. Does Simple Mobile have a BYOP plan? Yes indeed, Simple Mobile has a BYOP plan that ranges from single sim to triple sim. All you have to do is just head on over to any of their physical stores and they’ll do it for you. How much do I save money using Simple Mobile versus Verizon? Verizon is often a choice for the rich demographic and for the meticulous phone users because of its unbeatable coverage and network quality but the exchange is having to pay ridiculously high prices excluding taxes and other fees. As of 2014 to 2017, the average Verizon user spends as much as $148 just for their services. Simple Mobile averages around $28 to $69 a month depending on the plan you’ll purchase. Are there any hidden fees or overages in Simple Mobile? As their brand name already says, they keep things simple by not including any sort of hidden fees at all – no activation fees, no dreadful “other” fees, and no extra service fees. Overages are non-existent too especially with their Truly Unlimited data plan. How slow is the network throttle of Simple Mobile? According to users who have done their speed tests in speedtest.net, the internet goes around 900 Kbps to 2 Mbps. Yes, those numbers are very low but take note that they won’t charge you with any overages if you happen to exceed the data limit. When you do avail for the Truly Unlimited plan, those low numbers happen at very random times. You better hope it doesn’t throttle if you’re watching a live stream in SD quality or else the viewing will cut. Are there any other perks from Simple Mobile except for the extra hotspot for the Truly Unlimited plan? You’re buying Simple Mobile just for the essentials, so no, there aren’t any available perks around except for the Truly Unlimited plan hotspot. If you want to be spoiled with perks, you should be looking to the likes of Verizon, AT&T, T-Mobile or Sprint instead. Is the 1 GB plan too low for me? This really depends on the frequency of your usage. 1 GB should be more than enough if you’re not the talky type of person over the phone. It’s an average of 1000 free texts, 100 minutes of calls and a few minutes of live streaming. If you’re scared that you might blow out all that data before the monthly payment, just for the 2 GB plan instead. Will my data limit be automatically reset every month? If you want no hassle in having to stack up your data limit again, you’ll have to subscribe to their Auto Re-Up service.